A workshop to educate the business community on the programs of the Bureau of Contract Administration. 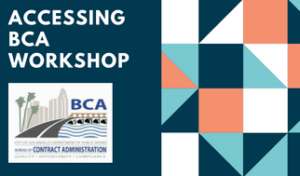 The Labor Compliance presentation will focus on Federal, State, and City laws, regulations, and other requirements associated with Public Works Projects. Topics will address Prevailing Wage, Apprentice Ratios, Payroll reporting requirements, Project Labor Agreements and Targeted Hiring. The Certification presentation will provide small businesses with information on the certification program offered by the City of Los Angeles. This will include the eligibility requirements as well as how and where to apply for each program and registering on the Los Angeles Business Assistance Virtual Network. The Minimum Wage Ordinance presentation will educate the small business on compliance requirements on the City of Los Angeles’ Minimum Wage Ordinance which include a paid sick leave component and the Fair Chance Initiative for Hiring Ordinance.